Impress, To Die For Tips & Tricks! Hi everyone and Happy April Fool's Day!! It's time once again for the Papertrey Senior Challenge. 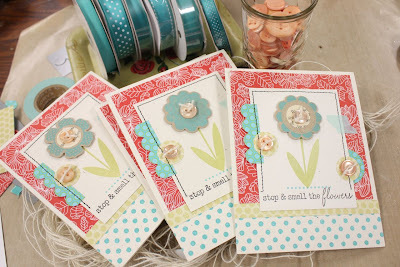 This month, it's all about Papertrey's new dies and Impression Plates. 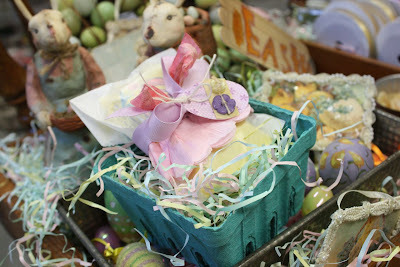 I've been working on some fun Easter goodies so I thought I'd share what I've been up to. Crepe paper embellishments are very popular right now and it's very easy to create your own. 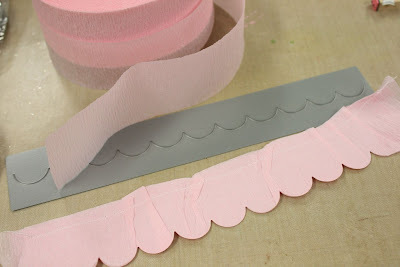 Here, I used 3-4 lays of pink crepe paper and stitched down one side, through all the layers. 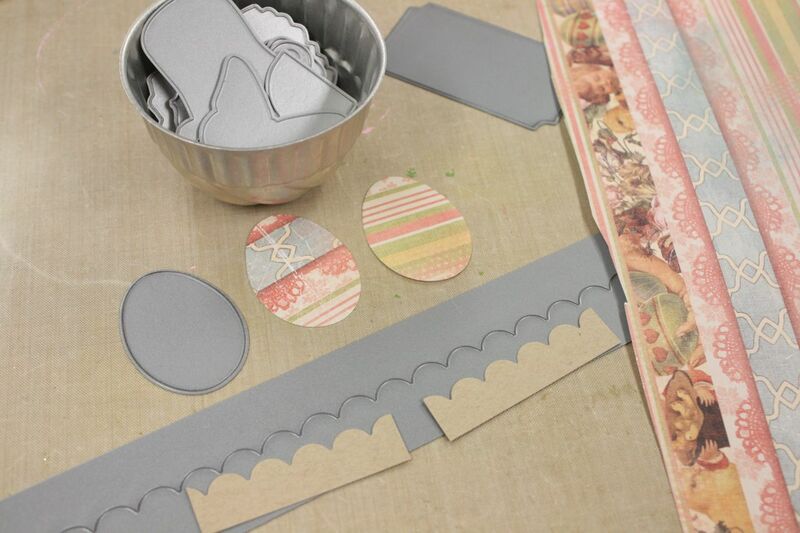 Then I cut my crepe paper layers with a Scalloped Border Die. The die easily cuts through all the crepe paper layers. 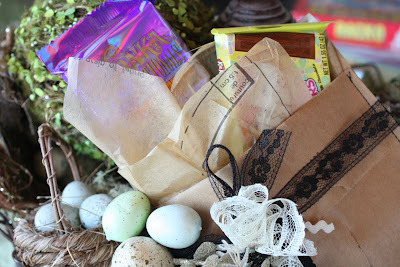 I ruffled up the scallops and added my crepe paper ruffle to an Easter treat sack. I packaged a Reese's Egg (my personal fave) in a medium glassine sack and used some ribbon and an Easter egg doodad from my stash to finish off the embellishments. I nestled my treat sack into a little egg container box with some Easter grass. Such a pretty little gift but so easy to mass produce if needed. 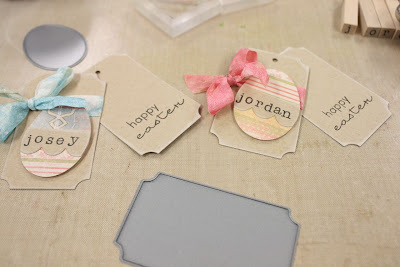 Next up, I needed to make some tags for my girls' Easter baskets. 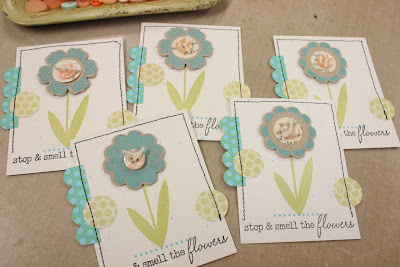 I used the Egg Die, the Small Scalloped Border Die and the Fillable Frames #1 Die. I die cut eggs from some pretty Karen Foster paper and cut the scallop borders from Kraft cardstock. I cut two Fillable Frames #1 dies for each tag so that I could stamp *happy Easter* from Pine's Egg Hunt stamp set on the inside. 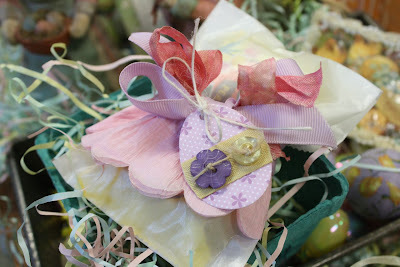 The finished tags are tied to the girls' Easter baskets using some of my Wrinkle Ribbon. I keep the tags from year to year in the bottom of the girls' baskets. It's fun to see what I made from the previous years. Pine keeps her tags to use in her girls' scrapbooks. Great idea! And here's my *oh so simple* die storage. I keep my Cuttlebug and dies on an old serving tray that I can wheel around my art studio. I picked it up at a garage sale a few years ago. I store my Papertrey dies in an old wooden box. The small dies are in a little tin jello mold and my long dies are in an old tin drinking cup. The Impression Plates just stand up in the box along with extra cutting plates and mats. Nothing fancy at all but it works for me. I really like to keep my tools out where I can see them....yet I want them to have some sort of organization. As my collection grows I'll probably create some filing tabs for my box so that I can sort through them quicker. Hi friends. It's been a trying week. In the midst of my dad being gone to Germany for two weeks, I had fun plans for my mom and I. We were going to sew and craft and shop while the girls were in school. Well, the plans changed. My mom has really bad arthritis and a bad back and this week has been horrible for her. I've been taking her to doctor's appointments, etc and I'm so glad that I live right down the road from her so I can help out. But it saddens me deeply to see her in so much pain. And she's not the sittin' around type. She wants to be in her garden and out and about. So then she feels badly when she needs to ask for help. But for all the things she's done for me in my life, it is now my turn to take care of her. I made her this pretty card today so she can sit it by her chair during those rare moments she actually takes a break and puts her feet up. 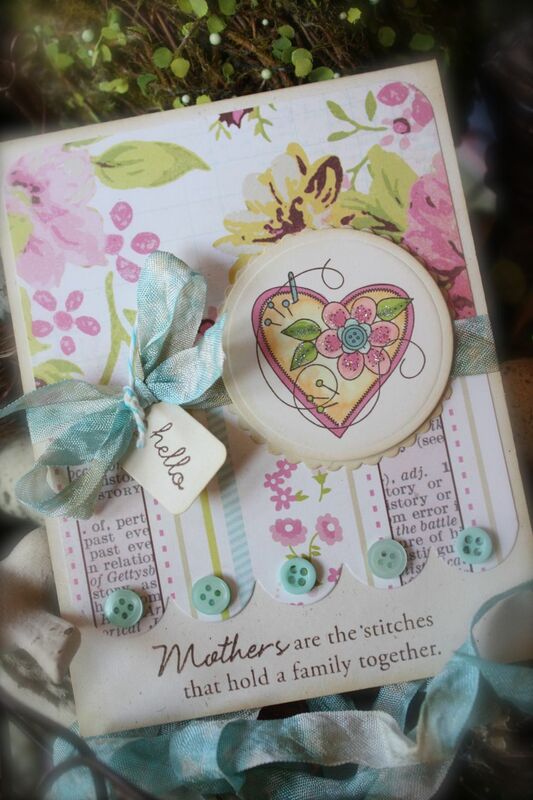 The main circle image is from one of my favorite JustRite sets called Stitched with Love. The illustrations in this set are so charming. 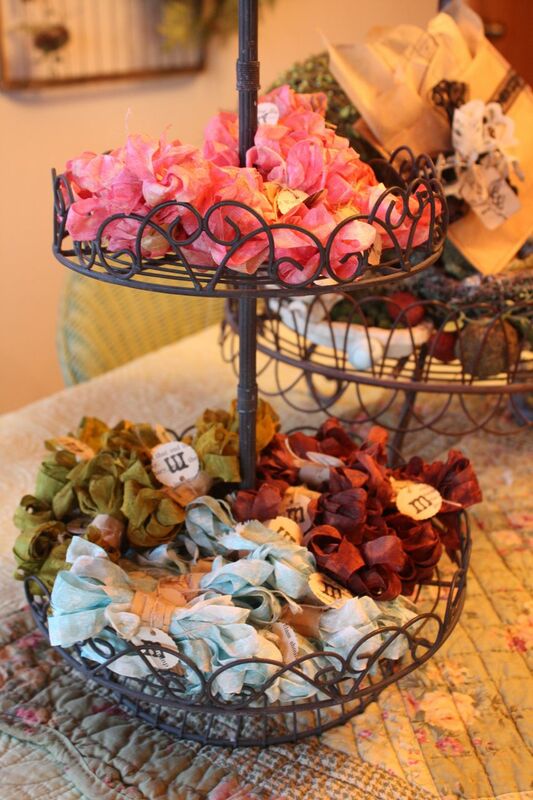 They fit in perfectly with all my homespun goodies. And I finally tore into my Girls' Paperie patterned paper. I couldn't stand it any longer, I had to create something with it. I colored the sweet heart image in with Copic markers and then added a little glitter for some shimmer. I tied the cared up with some of my Robin's Egg Wrinkle Ribbon and a tag I distressed with the word hello from Papertrey. 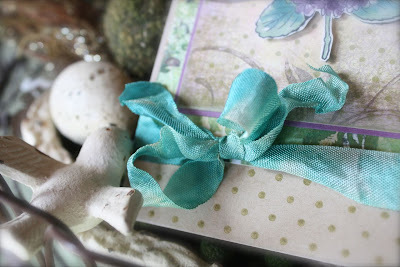 The inside of my card features some snippets of paper from The Girls' Paperie collection. 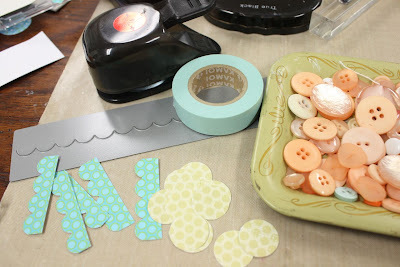 I love cutting little strips and mixing them up. So sweet. Here's my Copic colors I used today for coloring the image. 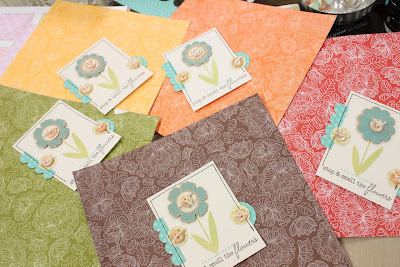 These colors are soft and pretty and work so well with the patterned paper. Well, I'm off to send out some Easter cards and get this one ready for Mom. I know she'll love it. Do you have someone that could use a card today? Perhaps a little pick me up or a sweet Easter card? Maybe hand deliver a card with a sweet treat? It will make some one's day. Hey everyone, I only have a few minutes to pop in today. Busy, busy, busy around here. I have a few kits going up in the shop today and thought I'd show you a few things you can do with them. In this first photo, I've tucked items from the kit into a Paper Pouch. I'll be carrying the Paper Pouches in my shop soon but they'll be sent out with the Kraft and Cream Kit too. 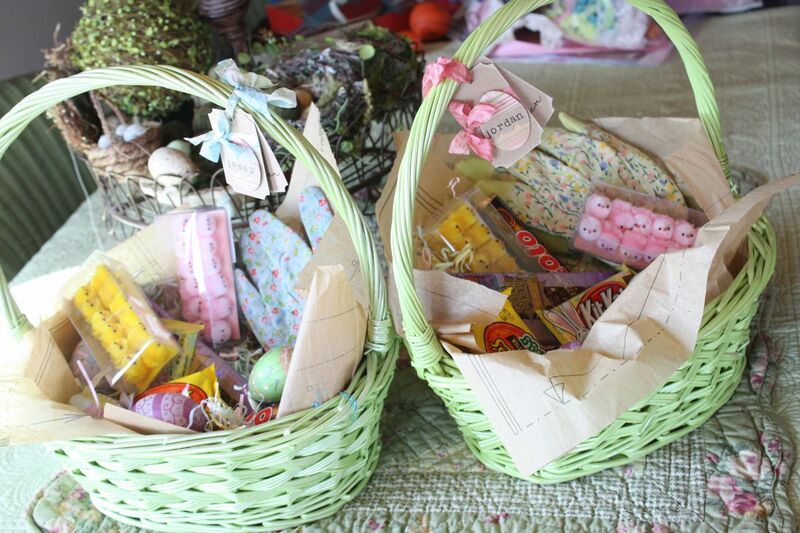 You can tuck in all sorts of goodies and tie on lots of ribbon, lace, tags, flowers, etc. All the goodies you see tied onto my Paper Pouch comes in the kit. You'll also get a piece of sewing pattern. 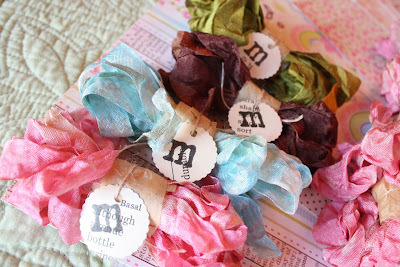 I've been using it for tissue paper to stuff into gift sacks, etc. 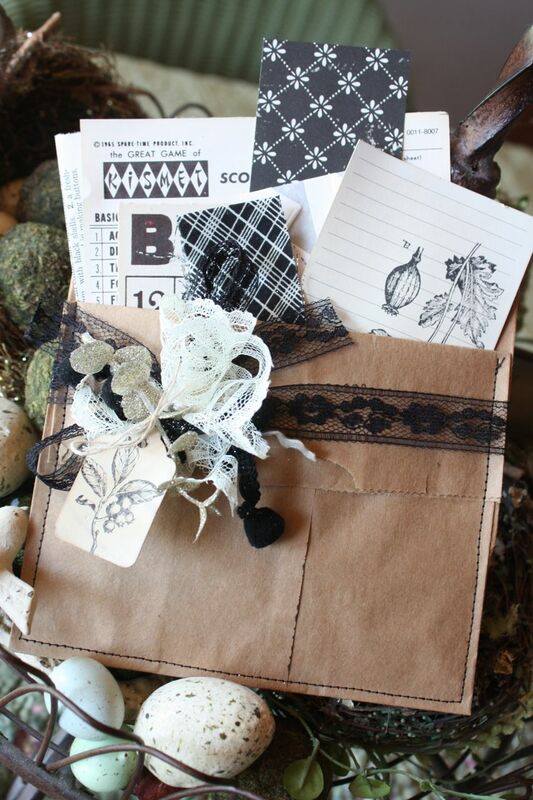 It looks so vintage and pretty in the Paper Pouch, don't you think? You'll also get a Bingo card in the kit. 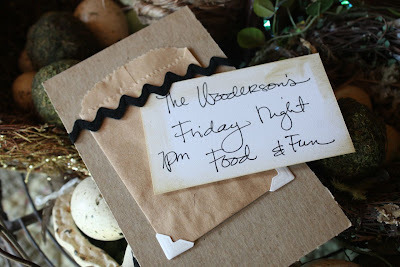 I've created a fun invitation for a Family Fun Night. I attached one my Mini Chalk Boards to the front of the card. You can write any message you like. 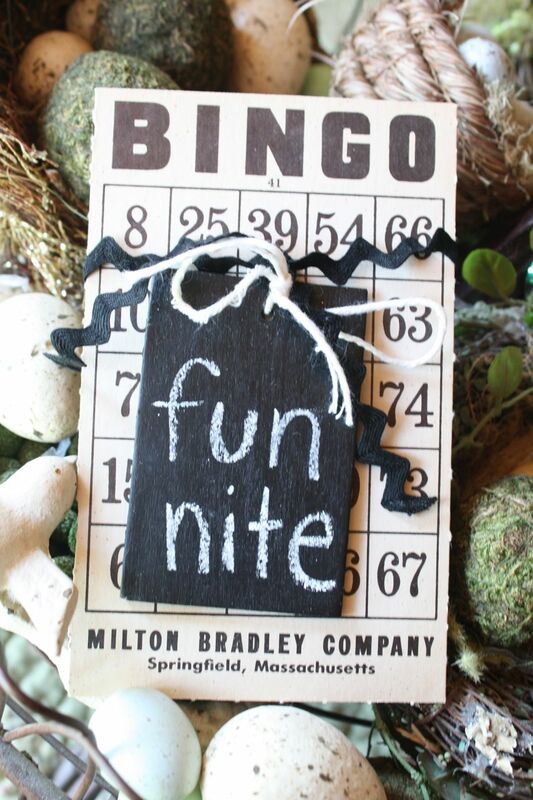 You'll get a Mini Chalk Board in the kit and I'll be offering these up in my shop soon too. 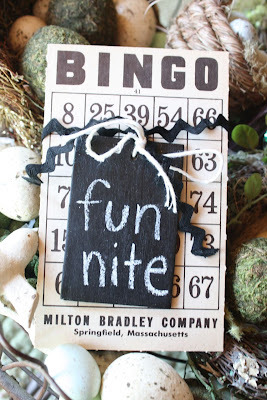 With more of the kit contents, I created a very informal invitation.....attach the paper sack to the back of the Bingo card with the corners that come in the kit. 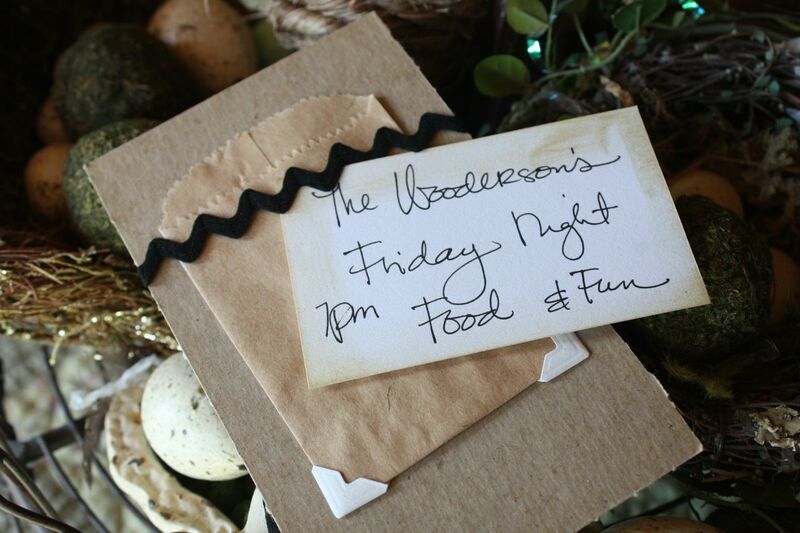 Sure to be a one of a kind invitation. Last week while in the city, I visited my local scrapbook store. 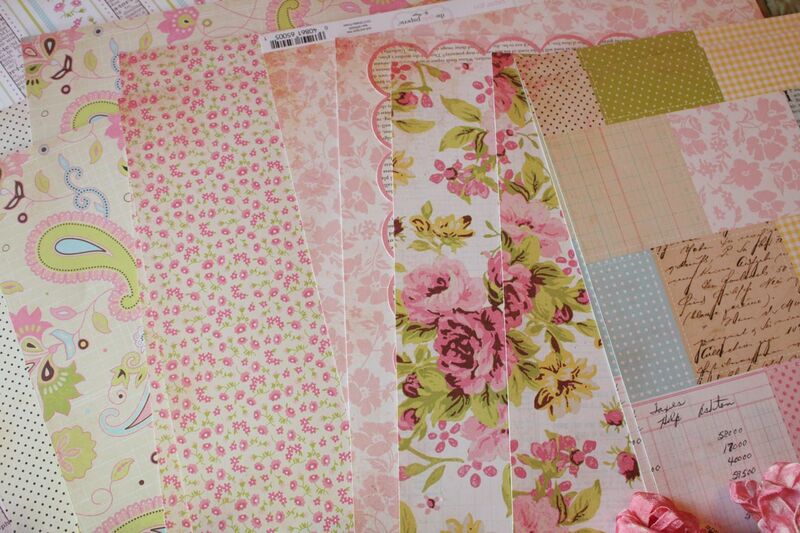 They had some new paper by The Girls' Paperie.....the new paper that I have been dying to get.....they had it! Way to go Scrapbooks, Etc. You can see it online here at Two Peas. I bought lots. And then some more. I don't have any projects to show you with it because I'm just looking at it for now. It's so pretty. So vintage-y. I'm in paper love. 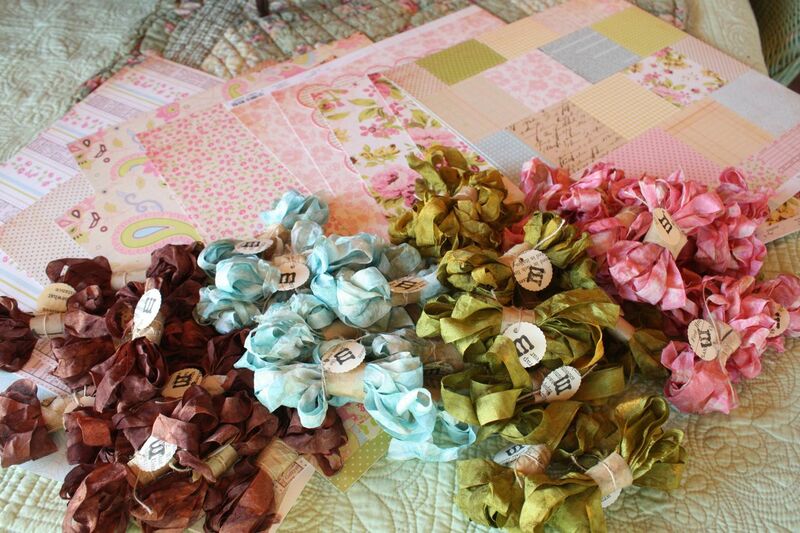 The Girls' Paperie is a new line of scrapbooking products by Margie Romney-Aslett. I can't wait to see what comes out next! I was so inspired by the beautiful colors that I had to create something with it. I still couldn't cut into the paper though. So I thought it would be a great time to introduce you to my Wrinkle Ribbon. Little bundles of wrinkled crinkled, faded and aged looking ribbon. Here's my first beautiful batch. 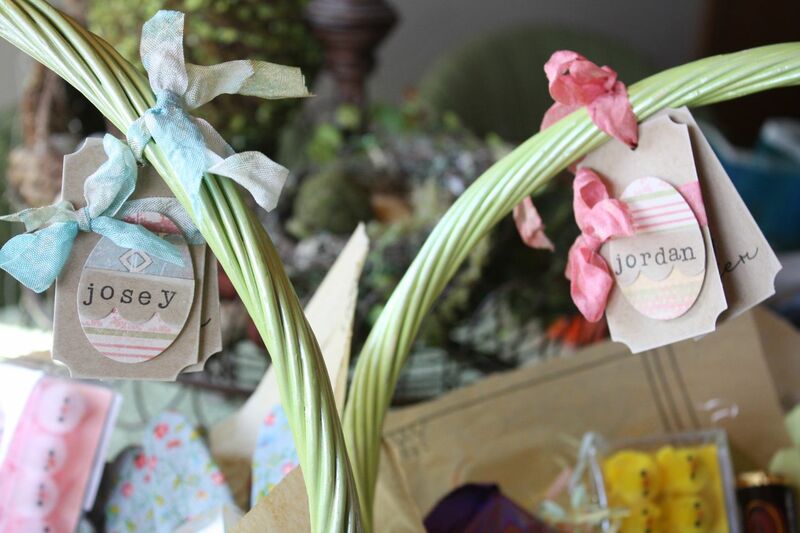 Bundles are packaged with a strip of sewing pattern and tied with a piece of twine and my monogram for Mish Mash. Each bundle comes with 3 yards of Wrinkle Ribbon. 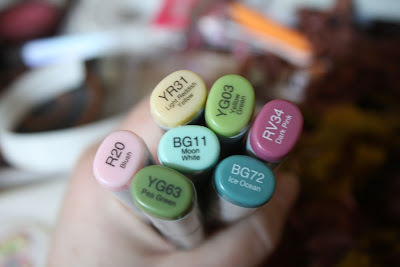 I'll be carrying lots of colors....perfect for cards, scrapbooking, gift wrap and more! 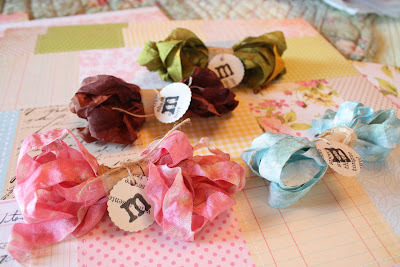 My first bundles of Wrinkle Ribbon are now up in my Etsy shop. Enjoy! Well here we are, folks. Welcome to Building a Better Card 101! If you've ever looked at someone else's card and thought, *I wish I could stamp like that*.....well, I'm gonna help you out today. It's about building your card upon simple design elements. Let's get started. First, use your tools that you've spent all that hard earned money on. If your supplies just sit on a shelf, you'll never know their full potential. Papertrey has oodles of supplies to help you out....from new dies to patterned papers to buttons. The possibilities are endless. For my cards today, I had a basic sketch in mind with a rectangle focal point. Nothing too fancy about the finished card design....but it's the details that make my cards exciting today. I want to show you some progression photos so that you can see how I *build* my cards. You'll be amazed at how the layers of details result in a fun focal point. 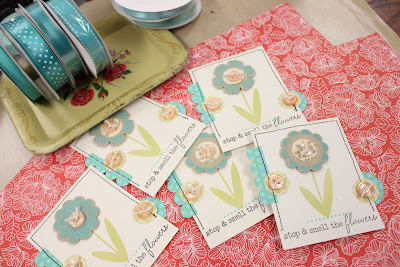 Today I'm using the flower stems from Wishing You, die cut flower doodads I made from Beautiful Blooms II and the matching dies, and a sentiment from Vintage Picnic Sentiments. Don't be afraid to get all mixy matchy with your stamps sets. It's okay. 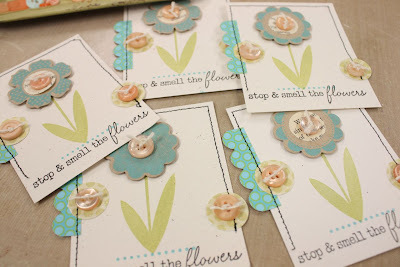 As you can see in the photo below, I started out with some simple stamping of the flower stems with the doodad flowers attached with pop dots. The sentiment is stamped below the flowers. Nice. 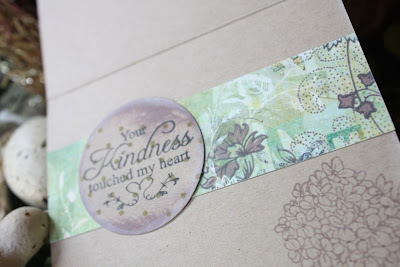 But I don't want just nice, I want to use some of my new dies and punches and patterned paper. I want some pizazz. 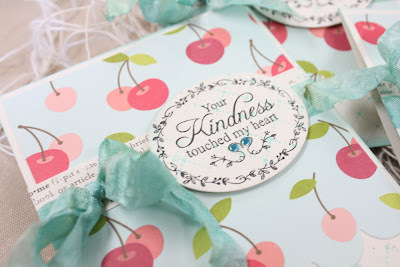 So I reach for some patterned paper (Green Boutique and Pretty Pastels) and make some punched circles and scalloped edges. I adhere them to my focal piece. But they seem to be *floating* in space. The pieces aren't grounded and they don't tie together. So how about adding some black stitching around my rectangle focal piece. The stitching touches each added element and ties them all together. The lines created by the stitching also add a border to my focal piece. No need to go all the way around because the black sentiment creates the bottom border. I've not got a framed little piece of artwork, so to speak. But my focal piece still looks a little bland. So I added some more tied buttons to the green punched circles. That looks great, don't you think? Here's where the design elements come in to play. You probably didn't even notice I was using design elements, right? Say what? Well, once you get used to thinking in a *designer* sort of way, it should come natural. It all just happens. COLOR: I used colors that were pleasing to the eye. 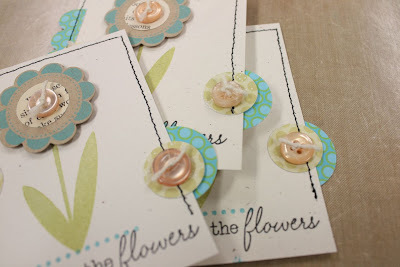 Notice how the color of the doodad flowers and the scalloped pieces are the same tone. Notice how the flower stems and the punched circles are the same tone. That creates an overall nice look. GROUNDING: This isn't really a technical term but it's very important when designing a card. Don't just let your design elements float around in space. 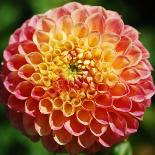 Ground them by creating a border, a horizon line, a grouping.....something to tie all the elements together. Balance your elements. REPETITION: Repetition is repeating some of the same design elements over and over. I already talked about how I repeated the use of the same color scheme in the color section above. Another way that I used repetition is with shape. Notice all the circular elements on my card. 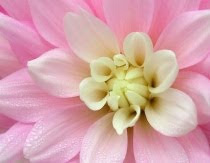 The flower is a circle. The inside punched text book paper is a circle. The three accent buttons are circles. The scallops are circular in nature. And look closely, the little stamp under the flower stems are a row of circles. Similar design elements are pleasing to the eye. Square buttons might not have worked as well on my focal piece. VISUAL TRIANGLE: This is very important. A visual triangle is simply three elements that are grouped together to draw the eye to the other elements in the triangle. The triangle does not have to be perfect. Just a grouping that creates a triangle. Can you point out some triangles on my focal piece? Let's see, the three peach buttons create a visual triangle. The circles that the buttons rest on create a visual triangle. And notice below that I went in after the fact and added an aqua punched circle behind the green punched circle. That adds a third aqua color element which creates a visual triangle. Now at this point, scroll back up to my first image, then scroll down. It all makes sense and my focal point now has lots of interesting details. Did I just luck out? I think not, friends. I used some great design elements to make it look great. You can do it too! Now how about the rest of my card? I had lots of color options that I could use behind that focal piece. 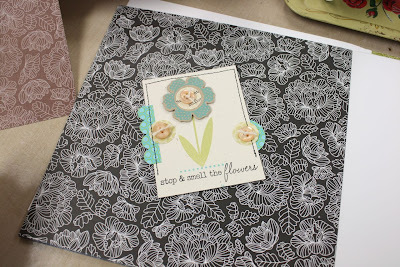 Usual In Bloom patterned paper, I had a subtle floral theme to choose from. I laid out a rainbow of colors below so that you can see lots of options. Zoom in on the photo below. I actually like ALL of the choices below. Each background paper gives a different look. The bright yellow looks punchy and fun. The green looks earthy and flowery. The brown looks a little vintage and subtle. But I decided to use the red background paper. I thought my green stems and greenish-blue flowers would compliment nicely with the red paper. COMPLEMENTARY COLORS: These are colors opposite each other on the color wheel. Even a touch of a complimentary color will make your project pop. Coloring purple flowers with Copics? 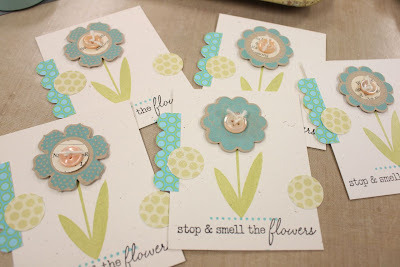 Add a few dots of yellow somewhere on the flowers and they will pop right off the paper. Seriously, you'll have to pick the flowers up off the floor. And here is my finished card. 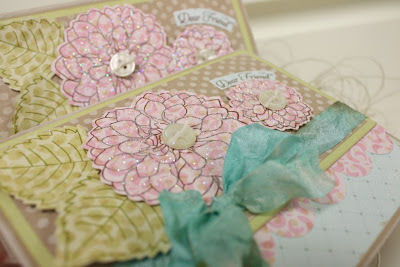 I continued the theme of repetition by stamping polka dots on the bottom of my card. 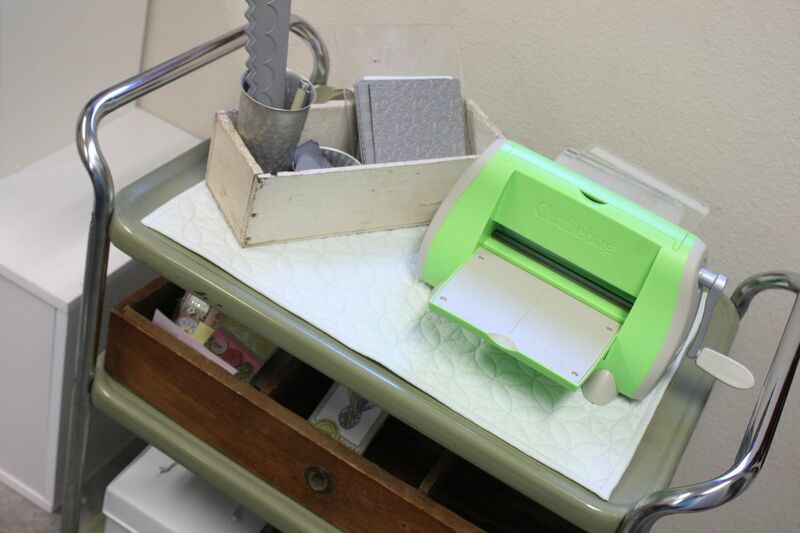 And I used more of the same green patterned paper as I did for the punched circles on my accent piece. I finished off the card with a torn piece of Japanese masking tape (you can google and find it lots of places). A fun grouping of cards that were well thought out. I used my design skills to tie all the elements together. It works for me. It'll work for you!! I hope you've learned some good tips today. Do you think you'll try some out on your next card?? Here's a link to some other design element terms you might find helpful. Enjoy. 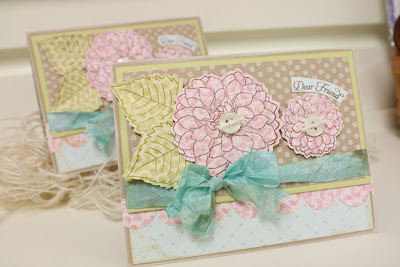 Here's another addition to the Papertrey gallery I did for March using Dawn's beautiful Dahlia stamp set. 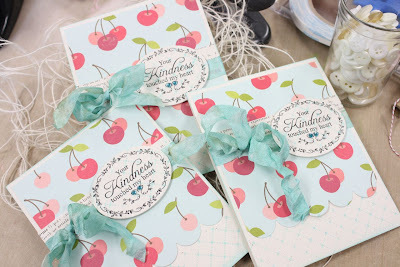 All of the images are stamped onto patterned paper from the Pretty Pastels collection. 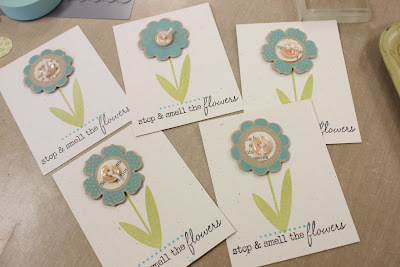 I then cut die cut them with coordinating dies that match both flower sizes and both leaf sizes. That is just WAY too easy. Crazy easy. I love it!! 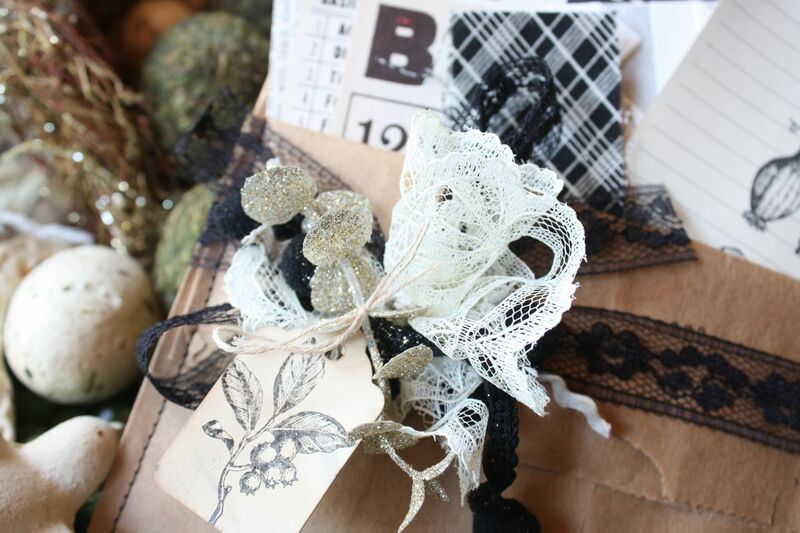 The flowers were highly glitterfied and finished off with tied Vintage Buttons. Some crinkly ribbon was added along with the *dear friend* sentiment that I cut out by hand. Hope you're all having a great week! Lots to do today so I better get a move on. My sister is coming for a few days to visit. Tomorrow we take my dad to the airport. He's going to Germany with his cousin to visit areas where he was stationed almost 50 years ago. I am so excited for him. 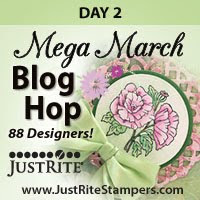 Welcome to the JustRite Mega March Blog Hop! 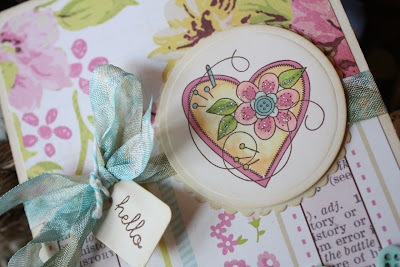 Today I have a vintage looking card made with Plant a Little Love Borders & Centers Round 3-1/4". 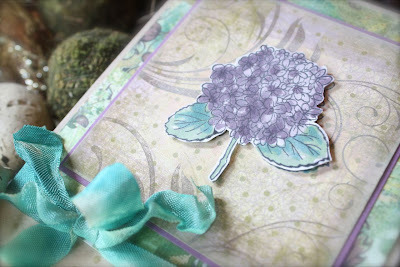 I created the focal point of my card by coloring the pretty hydrangea image with Copic markers. I then paper pieced the image and popped it up on my card with pop dots. I used some crinkly ribbon to enhance the vintage look of the card. I also used JustRite stamps on the inside of the card. It's fun to open up a card and see the inside embellished just as pretty as the outside of the card. 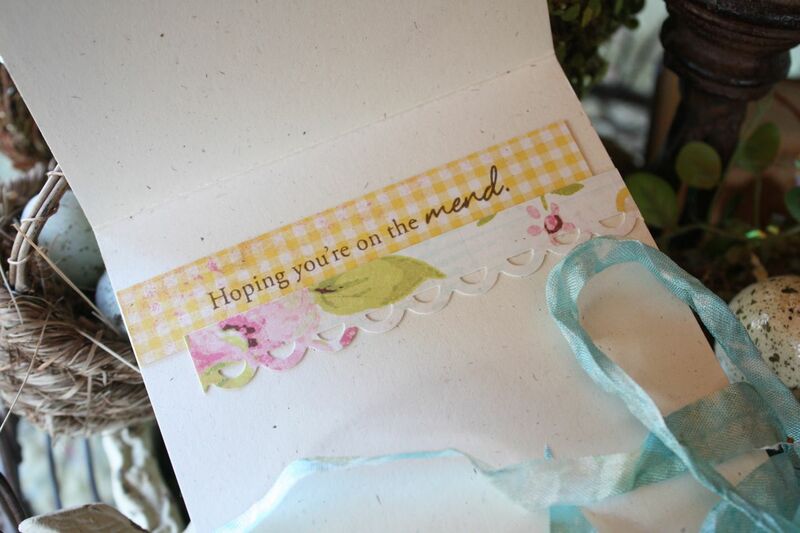 I used a sentiment from Joyful Hearts which was distressed a little with inks then punched out with a circle punch. 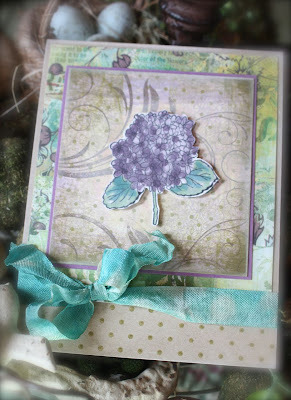 I also stamped the hydrangea image from the front of the card on the inside too. There's just enough space to write a nice little thank you note. 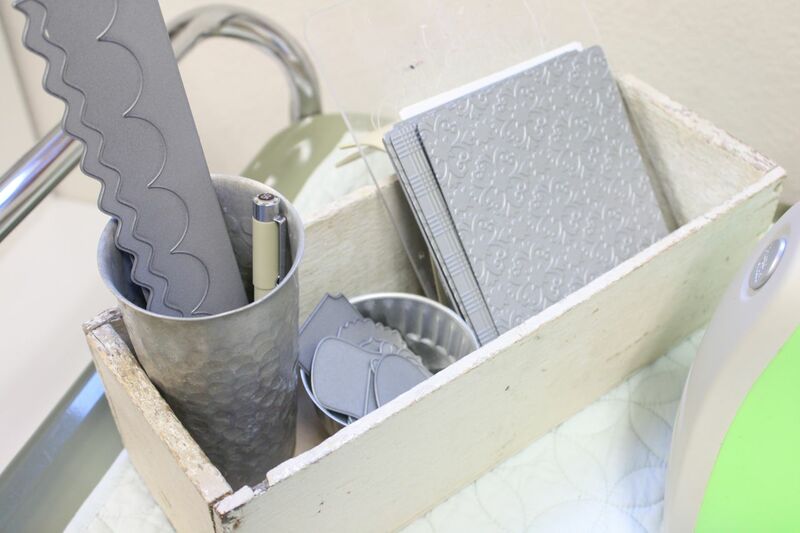 Patterned papers are from Basic Grey. Hope you enjoy!! Now for the blog hop details: You will get lots of inspiration today as there are 28 designers and FIVE shopping sprees each day. No one knows where the prizes will be! Each day of the hop JustRite will have five Mystery Blog Candy Prizes hidden along the hop with a total retail value of $600. JustRite will randomly select five mystery blogs each day of the hop and randomly allocate each of the shopping sprees. 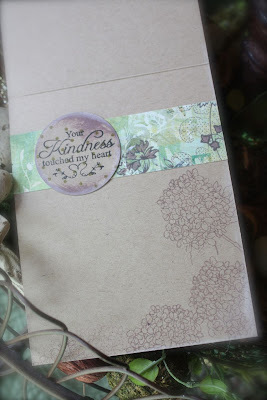 For your chance to win, simply leave a little love (a comment) on each designer’s blog including the JustRite blog. The more designers you leave comments with, the better your chances of winning. Each day’s comments will remain open for three days. A winner from each of the mystery blogs’ comments will be randomly chosen using Random.org. Consult the listing of designers at the JustRite blog each day (each day’s designers will be different) and start out on your way! Beginning Friday, March 26, summaries of all the winners will be posted on the JustRite blog. Good luck to everyone and enjoy all the JustRite eye candy along the hop! · Two additional $100 JustRite Shopping Sprees! Blog comments for Day Two will be open until Friday at 6pm EST. On Saturday, JustRite will announce on their blog which five blogs have the mystery candy for Day Two. You will need to go to the JustRite blog to determine where you need to go to find out if you are one of the five lucky winners. Hey everyone. I'm busy working on projects for the blog and my Etsy shop this week. 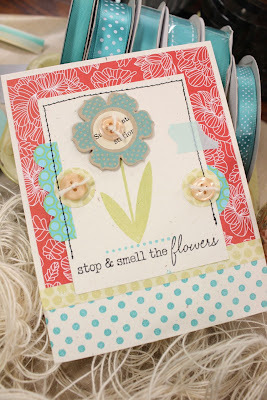 Thought I would share one of my favorite cards from my March Papertrey gallery. 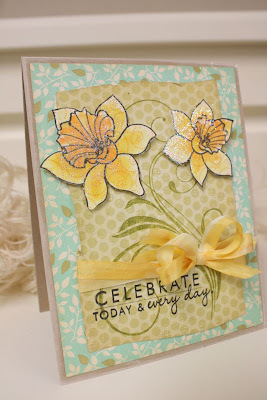 I created a vintage looking card by using the Year of the Flower: Daffodils stamp and the Flourishes stamp set for the swirly stems. 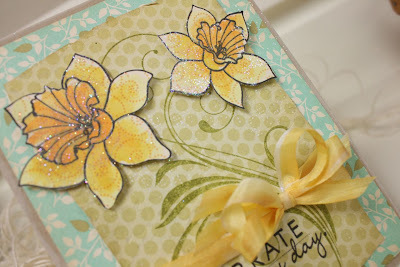 I used Copic markers to color the daffodils, which were stamped on a yellow paper from Pretty Pastels. The silk ribbon was colored with the same Copics to create a dreamy, vintage looking ribbon. All supplies are from Papertrey Ink. Enjoy! 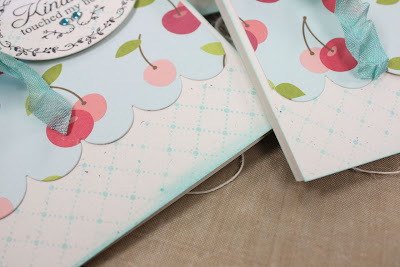 The bottom of the card is finished with scallops on the patterned paper and more of the Tin Types background stamping in Aqua Mist. P.S. Thank you for visiting my blog today. I'm so glad you stopped by. And a bigger thank you for those that leave comments. I know that takes a lot of extra time and it's so appreciated!! !